Michael’s first piping teacher was Richard Longstaff in Montreal. 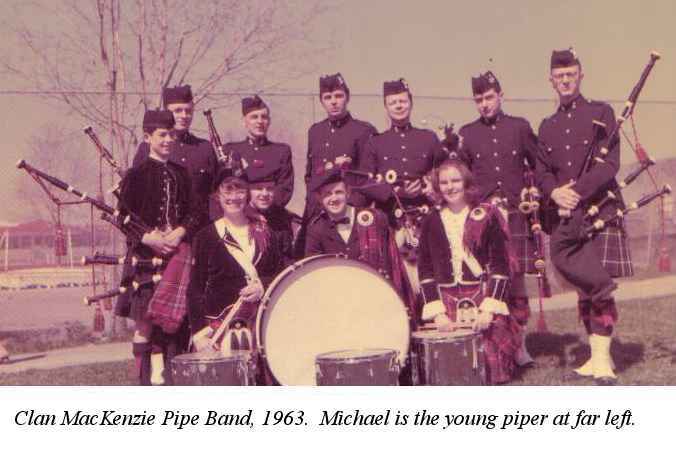 “As a young boy of 8 years old, I was drawn to the sounds of pipers playing in the sports fields of Lower Canada College in the west end of Montreal. Richard had a pipe bag cover that was a different tartan than the rest of the pipers and I had the courage to ask him why. The conversation continued and he asked me if I wanted to learn how to play the pipes. I ran home and told my parents I needed to buy a practice chanter. It all started like that. “Richard was a piper in the City of Montreal Pipe Band under the leadership of George Grant, formerly the Pipe Major of the Scots Guards in London, England. While I never had formal training from George, I remember certain things he would tell me about playing, and I remember attending his funeral as a 12-year-old boy in 1965. His tragic death was a tremendous loss to the piping community of Montreal and I cannot help but think of how my own piping might have been altered if he had not passed away. When Richard Longstaff moved to the USA, Adam Annandale helped Michael continue his piping development. “It was Adam who introduced me, and the entire band, to Archie Cairns in Ottawa in 1968. We all travelled to Ottawa, over 2 hours away, every weekend to get tuition from Archie. He taught me my first piobaireachd, “Tulloch Ard”. After the band stopped making the weekly pilgrimage to Ottawa, I travelled with Dr. Stuart McBride. “Archie was a tremendous influence on me. In 1970, it was time to go to University, and I chose Carleton in Ottawa so that I could continue to study with him. My time with Archie took me to the Grade 1 Amateur Solo level and in 1970 I won the Ottawa Piping Club medal. In 1971 I joined the Grade 1 Rockcliffe band, which was an unbelievable musical experience. Archie and John Kerr innovated with “alto drumming” where snare drums were tuned differently, and drum scores were written to match the top and bottom hands of the chanter. It was revolutionary at the time and I remember spending much time in the band listening to the drummers. I also remember being able to identify drum scores to tunes without the pipes, just because John Kerr’s scores were so sympathetic to the music. “I left the band when my University studies became too difficult for me to do both things well. This upset Archie and when I finished University I accepted a job in Ottawa expecting that I could continue to get lessons with him. Archie refused to teach me, however, and sent me to his pupil, George Robertson. George was a great teacher and taught me “Too Long in this Condition”, a tune I still play today. “In the summer of 1975, I took the summer off to practice pipes. I moved to a friend’s farm in MacCrimmon’s Corner in Glengarry County, and competed in the Ontario Amateur Grade 1 solo competitions. In November, I moved to Glasgow where I got a job as a “cellarman” in a pub and joined the Muirhead and Sons Pipe Band. That was a life-changing experience for me. Not only did I gain an appreciation for our quality of life in Canada, there was a spirit amongst pipers I had not experienced before. My best example is Rab Wallace (currently principal of the College of Piping) who also played in Muirhead’s. When Rab first saw me play he noticed that my head was turned away from my instrument and thought it presented a negative perception. He told me my blowpipe was too long and I should get it cut down. Bob Hardie must have cut 2-3 inches off of it. That may sound like a small thing, but Rab was the first person in 14 years of playing to mention it to me, and it was absolutely the right thing to do. “Much of my initial time in Scotland was spent learning the band tunes and trying to bring my level of playing up to the required standard. I remember asking Bob Hardie if he thought I would be able to “make” the band. He kept telling me only if I worked very, very hard, so that was exactly what I did. “In those days, pubs shut down after lunch so I used to go back to my flat and practice before the evening shift. By January the manager suggested I should ask for a raise, but I told him I needed another night off as the band was practicing three nights a week so he made that possible. “Once I began to feel more comfortable with the band repertoire, I approached Bob about getting some piobaireachd lessons. Bob was a very shy person but agreed to take me on and began by teaching me “The MacGregors’ Salute”. Over the months before the band got into the competition season, he also taught me “The Lament for Mary MacLeod”, “Donald of Laggan” and “The Massacre of Glencoe”. “I found that the two cultures (solo piping and band piping) were distinct in Scotland and many solo pipers were far more open to helping their peers improve than I had ever experienced in Canada. My feeling on this matter may be influenced by the fact that I was from Montreal and I never felt welcomed by my Ontario rivals, but even after having spent over 30 years in Ontario, I still do not feel the spirit of open collaboration between solo pipers that I experienced in Scotland. “I returned to Canada in November 1976 and the election of Rene Levesque in Quebec forced me to move to Toronto in the spring of 1977. A chance encounter with Willie Connell at the Burlington Highland Games, and his association with Robert Reid encouraged me to study with him. That lasted many years and I learned the majority of my piobaireachd from him. Every year Willie would teach me the Gold Medal set tunes so I could compete in the Piobaireachd Society (Canada) Gold Medal Contest. Willie was a tough but patient teacher for over 25 years, as I never really attained the level of success in competition that he expected and wanted for me. From 1985 to 1990 I travelled to Scotland to play in the Silver Medal contests in Oban and Inverness. I always stayed with Bob Hardie and went over the tunes with him before the contest. He confirmed what Willie Connell had taught me. “Less formal training also took place with a number of great pipers who were also my friends who from time to time listened to me in their homes, and provided constructive comments. This included Bob Worrall, Bill Livingstone, Dr Angus MacDonald, John Finlay and Jim McGillivray. All have helped me along the way to achieve a balanced perspective of this great music. “As a youth in Montreal, the centre of our piping universe was the Black Watch Armoury where the quality of piping was at a grade 3 or 4 level. The City of Montreal and the Mount Royal Police bands I played with were of higher calibre, but there were no monthly venues like the Fort York Armoury and the Toronto P&PB Society branch meetings where pipers met and played during the winter months. My first pipe band was the Clan MacKenzie Pipe Band, which was under the auspices of the Royal Canadian Engineers at the Hillside Armouries in Westmount. My first teacher, Richard Longstaff was the Pipe Major of this band. I then moved to the City of Montreal Pipe Band which then became the Mount Royal Police Pipe Band under Pipe Major Donald MacFarlane. 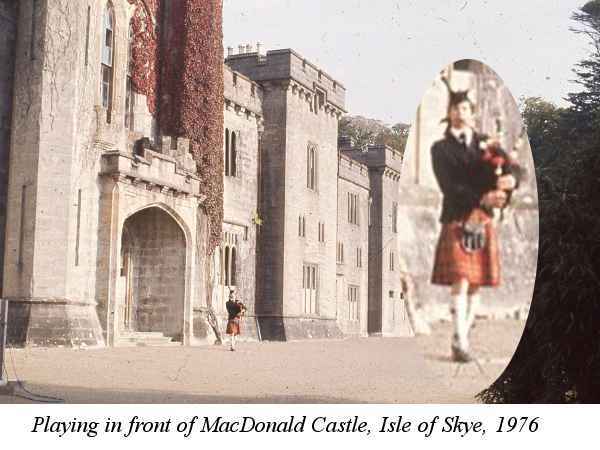 “As a summer student from 1968-70, and again in 1973, I was a member of the original 78th Fraser Highlanders at Le Vieux Fort (now the Stewart Museum) on St. Helen’s Island in Montreal. In 1971 I joined the Fort Henry Guard in Kingston, Ontario as a member of the Fife and Drum band, while also playing the lament on the pipes in the Sunset Ceremony. It was after the summer at Fort Henry that I moved to Ottawa. “I taught the Georgetown Ladies Pipe Band for one year in 1990. In 1992 at the Maxville Highland Games I heard the 78th Fraser Highlanders playing the march “The Conundrum” and was overwhelmed with the phrasing of the tune and the sound of the band. I mentioned this to Bill Livingstone in the beer tent who replied, “Why don’t you come and play with us?” So I did. We had a very successful year in 1993 wining the North American Championship at Maxville and placing 6th in the World’s in Scotland. I was pleased that my initial teacher, Richard Longstaff was up from the USA and heard us play. “At the end of the summer, I signed on with the 78ths for another year. This was a mistake, however. My wife was pregnant with our first daughter, Madeline, who was born on February 15th in the middle of the intense learning, concert and practice period of the band. Madeline was not a great sleeper and it was difficult for me to put the effort in required for the highly demanding repertoire and the volume of tunes put down at each practice. This turned into another great piping regret because of the stress it put on my family. I had no idea how having children would change my life. While piping is important to me, it should never have come before my family. Michael did manage to win a few big prizes over the years including the Boreraig Trophy and the Clan Donald Quaiche for Piobaireachd at the Colonial Highland Games in Maryland USA in 1980, 1st Prize for Piobaireachd at the John Wilson Memorial Contest in Toronto and 2nd Prize in the Piobaireachd at Maxville (North American Championship) in 1984, as well as 3rd, 4th and 5th in this contest in ‘83, ‘86 & ‘91. “In 1984 I was also named Piper of the Day at Ligonier PA and won the Piobaireachd at Sarnia. In 1989 I took the 1st Prize for Piobaireachd at the Pugwash Highland Games in Nova Scotia, and in 1990 I won the Fergus Gold Medal for Piobaireachd and was also named Piper of the Day in the Canadian Championships. I won a number of prizes in the Silver Medal at Oban between 1985 and 1990, and at the North and South Uist games in 1983. My most favourite prize, however, was a 4th or 5th prize (I cannot remember which) at Oban in the Open March contest in the late 80’s. This prize entitled me to play in the ‘A’ March category for a few years until I stopped going over to Scotland to compete. 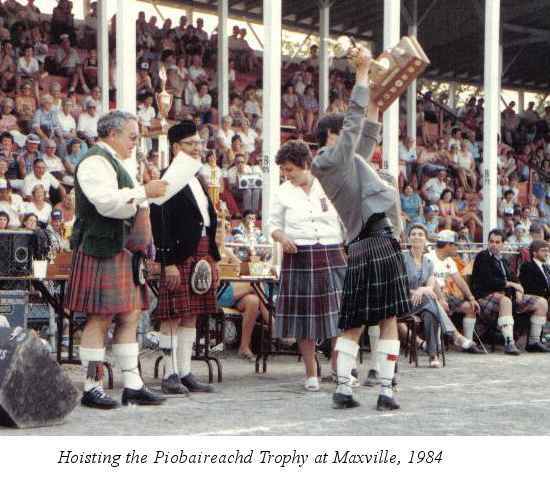 “I would have to say that my most memorable but fleeting achievement was winning the Maxville Piobaireachd trophy in 1984. It was one of the greatest moments in my piping life. Finally the North American Champion! Later that evening, I saw Bill Livingstone and asked him how he played since he didn’t get a prize. He replied that he thought he had played a great tune. I was puzzled. The next day in the parking lot of the Montreal Highland Games I asked the judge (Willie Connell) why Bill Livingstone didn’t get a prize in the contest. He replied that in fact he did win the contest. With a little bit of research we found that the Society had mistakenly turned an 87 into an 81. I had 86 ½, so in fact I was second. I gave Bill the trophy and continue to this day to try to win it back fairly. “I have only composed two tunes and am working on a third one. The first tune is a jig called “Madie’s Jig” named after my oldest daughter Madeline. She plays the Irish fiddle and I was inspired to compose this tune one day as I listened to her playing. Once I composed it I realised I couldn’t compose a tune for one daughter and not the other so I started working on a slow air called “Leah’s Lullaby” and you can hear me playing it at http://littlewoolly.com/ under the video folder. “The only commercial solo recording of my playing was when I got a fifth prize in the March, Strathspey, Reel, Hornpipe and Jig event at the Livingstone invitational contest in 1990. My royalty payment was two free cassettes, one of which I gave to my father. This is a recording that only a father could love. I also appeared on the World’s 6th place performance with the 78th in 1993, and one of the tunes in the medley is “Michael MacDonald’s Jig”, a great tune composed for me by my good friend Jim McGillivray. A better gift could not be given. When I asked Michael what advice he might have for others, he said, “Try and find a good teacher. It takes a good teacher to draw out of you the best that you can do. And teachers should always be on the lookout for good students. A good student can make you push yourself to become a better teacher. “It always amazes me when I go to some of the premier contests as a player or spectator and I notice that there are not very many young players there to listen. There are two excellent venues in Ontario, The William Livingstone Invitational, held in the Officer’s Mess in the Armoury on James Street in downtown Hamilton in the spring each year. The Piobaireachd Society (Canada) Gold Medal is another great venue for listening to fine piping. I believe if young people were to make an effort to go to these contests and listen to some of tunes it would go a long way to help them in their own piping. “While I was living in Scotland in 1976, I travelled to Edinburgh to listen to the Eagle Pipers Competition and heard Donald MacPherson playing a tune called “The Vaunting”, which really blew me out of the water. I never ever imagined that a bagpipe could sound like that. When he hit the “a’mach”, it was a defining moment in my musical life. Another great performance was in the late 80’s at Oban when Donald was playing his piobaireachd the Phoenix Theatre. The sound of his bagpipe overwhelmed me. It seemed to fill the hall so that if you closed your eyes, you could not tell where he was standing. The drones seemed to move ever so slightly to blend with every note of the chanter. Bob Hardie was one of the judges and after the contest all he said to me was “Did you hear Donald MacPherson’s pipes?” He too was very taken with the sound. “In Ontario I always enjoyed listening to Bill Livingstone play his piobaireachd, and I loved the rhythmical playing of Jim McGillivray. Both of these players had bagpipes that were always exceptional. The fact that Bill continued to compete in the solo competitions until he was in his 60s has been an inspiration for me. “Sometime early in 2007 I happened to notice an advertisement for a number of used musical instruments in our local coffee house. One happened to be a Scottish lowland pipe made by Harriot and Allan. I had heard Jim McGillivray play a similar set and was intrigued by the quality and sound volume. My daughter Madeline was also getting quite good at the Irish fiddle and I thought this might be an opportunity for us to make some music together. I ended up purchasing the fine instrument, and we worked on a set together and performed at a local jazz club in the neighbourhood one Saturday afternoon. I have since played this pipe at a number of house parties where groups of people are more than happy to sing along to a wide variety of songs. I have even performed on stage with singer/guitar player Jim Fay. “Currently I am preparing for the Gold Medal Contest at Maxville and another try for the Open Piobaireachd the following day. I am lucky to have had great piping teachers in my life, and I believe that playing music for other people to enjoy is a privilege. I hope that I can continue to bring happiness to others with my playing for as long as possible.